Lightly whisk three eggs (save the other for a later step). Then slowly stir sugar and flour and salt into eggs. While the batter rests, melt the butter, bringing to a gentle boil and letting it brown ever so lightly. Let butter cool, whisk remaining egg then slowly add the egg and cooled butter to the batter. Now add the grated lemon rind, lemon juice and vanilla with a large spoon. Place the batter into a bowl, cover and place in the refrigerator (or if you are more patient than I, you can stir over ice until batter is cold and thickened.) When the batter is cold and very thick, drop by generous tablespoons into the Madeleine pans that have been sprayed with the cooking spray. Do not spread the dough out, as the batter should look like little balls in each cup of the pan. Bake in a preheated oven at 375 degrees Fahrenheit for about 12 to 15 minutes until Madeleines are lightly browned around the edges and slightly pulling away from the pan. 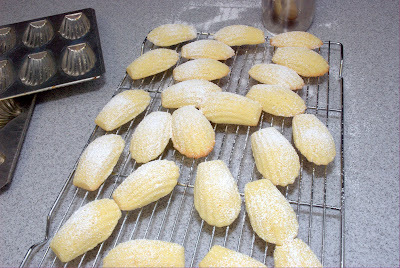 Tap to unmold Madeleines onto a rack and let cool with shell pattern side up. Sprinkle with powdered sugar just before serving. *Never use a butter substitute or I will personally force you to read all seven volumes of Proust’s Remembrance of Things Past.